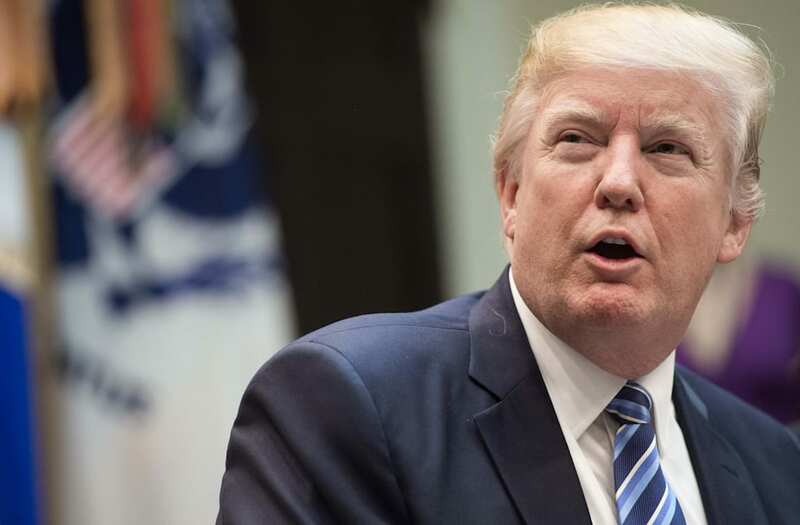 The White House announced that President Donald Trump paid $38 million in taxes on more than $150 million in income on Tuesday evening. The announcement came in response to MSNBC host Rachel Maddow's report that she had obtained Trump's 2005 tax returns. Maddow shared a copy of the president's 1040 form, confirming that he paid more than $38 million on income of more than $150 million. Maddow invited tax reporter David Johnston of DC Report, who obtained the returns, onto her show to explain them in more detail. Johnston said that the Trumps paid $5.3 million in federal income tax that year, while paying an additional $31 million in what's known as the "alternative minimum tax." President Trump has at times called for the elimination of the alternative minimum tax, a point Johnston made repeatedly during the interview. Without the alternative minimum tax, the tax rate would have been less than 4 percent. With the alternative minimum tax, he paid more than 20 percent. @NBCNews He found them in his mailbox?? Did the Russians put them there?? Well folks let's see what this is all about. RT @maddow: BREAKING: We've got Trump tax returns. Tonight, 9pm ET. MSNBC. (Seriously). The only news out of this is that the White House CAN release the President’s taxes, despite what campaign said. Which we all suspected. We have information now that we did not have yesterday on a story the public has a continued interest in seeing reported. Quit your whining. Johnston also claimed during his interview that Trump has done business with a drug king pin and mobsters, saying that those prior interactions justify the release of Trump's returns so the American people can know more of about the president's financial dealings. "You know you are desperate for ratings when you are willing to violate the law to push a story about two pages of tax returns from over a decade ago," the White House said in a statement released shortly before the report. "It is totally illegal to steal and publish tax returns," the White House statement continued. "The dishonest media can continue to make this part of their agenda, while the President will focus on his, which includes tax reform that will benefit all Americans." "For the record, the First Amendment gives us the right to publish this return," Maddow said in response to that statement. Maddow said during the program that Johnston of DC Report shared the returns with her. Johnston said he received the returns in the mail. Trump became the first major party presidential candidate in modern history to refuse to release his tax returns during the 2016 campaign cycle. He justified that decision by saying he was under audit and could not until it was done. Since taking office, members of his administration have repeatedly reiterated he had no intentions to, insisting that voters and citizens were not interested in it. Prior reports have shown that at certain points in his career Trump paid no federal income taxes. That includes at least twice in the late 1970s, according to a Washington Post report from last year.